Gentry Day turned out be a damp squib for the faithful who ventured to The Hawthorns in their vast numbers only to witness a drubbing which saw our heaviest defeat of the season so far. In my opinion the talk about the future of our manager Alex Neil had a negative impact on our performance and once West Brom took the lead we were never in the game and easily capitulated to a rampant home side. The main talking point amongst the faithful was the possible departure of the manager to take up the position as the new West Brom boss. Some of the Albion fans I spoke to on the train on the way back to Birmingham were not as enthusiastic as I thought they would be about his seemingly imminent appointment. But the news on Sunday that Neil has signed a new three-year deal at Deepdale leaves me delighted. As for Saturday’s display, we had a great deal of possession during the game but there was no end product and we had to be grateful to goalkeeper Declan Rudd for keeping the score down. It is hard to take any positives from this game as we were totally outclassed and looked like a lower-division side playing a cup tie against opponents from a higher league. For many of the fans the visit to The Hawthorns was a case of ‘been there before and got the T-shirt’ with the defeat being the 10th in succession at this stadium, which makes this venue the mother of all bogey grounds with our last victory there coming in the 70s when most of the original Gentry were alive and kicking. 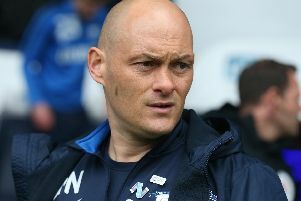 So, as it turned out, Alex Neil signed a new three year deal to stay at North End which can only be good news for all Preston fans. During Saturday’s game some players looked a bit off the pace and no doubt will have been distracted by potential changes to their working environment. Hopefully though now things are settled this display will become a one-off and we can get back to looking like the side which won six away games on the bounce until this run ended at Reading a fortnight ago.